KC Production Community – Take Action Now – We Need Your Help for House Bill 803, Missouri State Film Incentives. It’s time to email your Missouri HOUSE Representative. This effects the Greater Kansas City production industry. A lobbyist has been retained by MOMMA (Missouri Motion Media Association) to lead the effort to reinstate Missouri’s film incentive program and we are being asked to submit emails of support from industry professionals, businesses and film industry supporters. Click here to find your Missouri House representative. 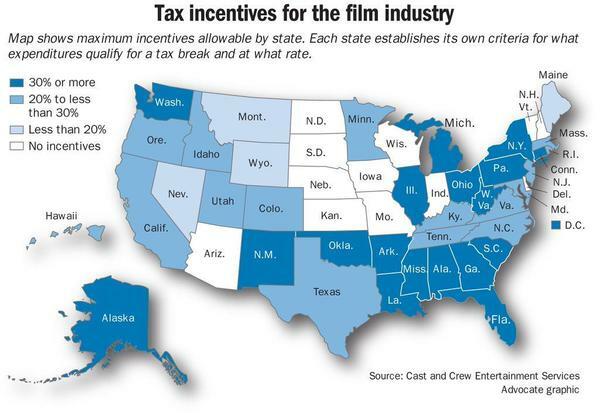 38 States have incentive packages for film/TV/commercial production making them more competitive for bringing in projects, sustaining and growing their workforces – let’s work together to add Missouri to this list! HB 803, sponsored by Representative Kathy Swan, has been placed on the House Calendar and will receive a house floor hearing this week. This bill reinstates the Film Production Incentive Program that sunsetted in November 2013. Without this program, Missouri cannot compete with the 38 other states that have incentive programs to bring this NEW business to our state. Many Missouri communities have testified to the tremendous economic impact they experienced (prior to November 2013) from a film production in their area – economic activity that simply would not have occurred but for the incentive. Please support HB 803 – it’s critical to the Missouri workers that make their living in motion media all around our state. Production companies do not receive any incentive from the program, until after they film and after they have verified their receipts and have been audited by the Department of Economic Development. The incentive can be used in any community in our state – rural or urban. Missouri has a lot to offer this industry – but we must be competitive!